The robotic systems used in most e-commerce fulfillment centers rely on suction grippers which can limit the range of objects they can grasp. 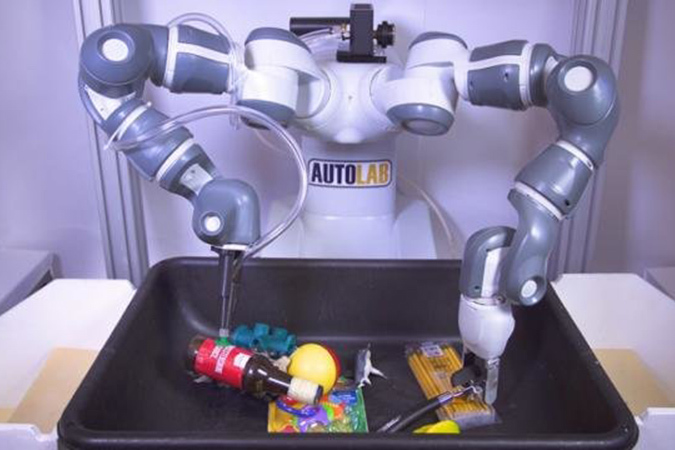 The UC Berkeley paper introduces an "ambidextrous" approach that is compatible with a variety of gripper types. The approach is based on a common "reward function" for each gripper type that quantifies the probability that each gripper will succeed. This allows the system to rapidly decide which gripper to use for each situation. To effectively compute a reward function for each gripper type, the paper describes a process for learning reward functions by training on large synthetic datasets rapidly generated using structured domain randomization and analytic models of sensors and the physics and geometry of each gripper. "When you are in a warehouse putting together packages for delivery, objects vary considerablyWe need a variety of grippers to handle a variety of objects," said Goldberg. The research for this paper was performed at UC Berkeley's Laboratory for Automation Science and Engineering (AUTOLAB) in affiliation with the Berkeley AI Research (BAIR) Lab, the Real-Time Intelligent Secure Execution (RISE) Lab, and the CITRIS "People and Robots" (CPAR) Initiative.